The Bishop Union High School Bronco JV football team will begin fall practice at the earliest possible time, 12:01 AM Monday, August 3rd. The Midnight practice will be held under the lights at the Bishop City Park, Field 1. The city park is being used due to the field improvement project underway at Bishop Union High School’s John Schwab Field. Parents and fans are encouraged to attend the practice session as the Bronco JV kick off fall camp. In order to participate all student athletes must have there physical packet turned in. James Ferrell is now serving as Head Coach of the Junior Varsity. Ferrell as been an assist with Bronco Football the previous 5 seasons. Former JV head coach Arnie Palu will remain on the staff as an assistant working with the offensive line. Palu served as head coach the previous 5 seasons. Joining Ferrell and Palu on the 2015 JV staff are assistants Dan Nolan (defensive coordinator), Cody Lawson (defensive line), Rick Beall (offensive and defensive backs), and James Tyler (special projects coordinator). Questions should be directed to Coach James Ferrell, (760)-937-6247.
cover photo, 2014 JV MVP Moran West vs. Rosamond. Photo by Gary Young. To give the main field time to rest the school has been working with the City of Bishop to install a practice field in the rear of the city park. Due to the ongoing drought, that effort has stalled as the city is holding off seeding the new field. Simpson is hopeful the new city park field will be planted this fall. 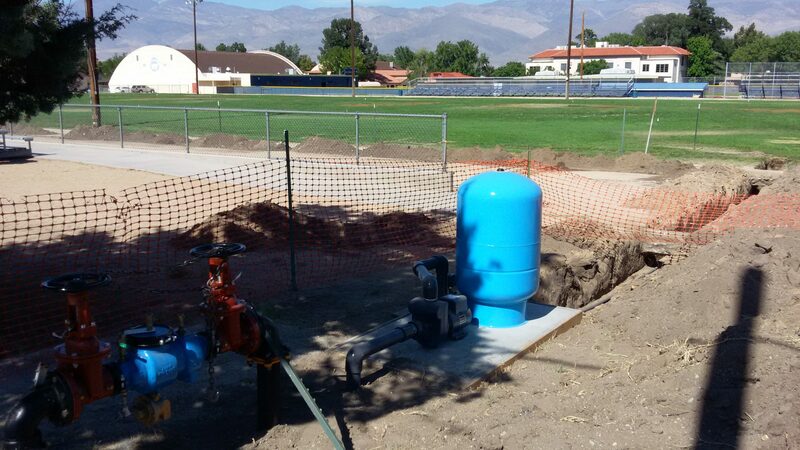 To address the irrigation system, new infrastructure in being installed. The track and field are currently closes as open trenches exist near the finish line of the track and the length of the 50-yard line. Following the irrigation upgrade field treatments will continue. The first scheduled home game for the Broncos is set for Friday, August 28th. The Broncos will open at home with Whittier Christian. irrigation infrastructure near home street. The 2015 Bishop Bronco football schedule has been set. For the third consecutive season the Broncos will open up the season with Whittier Christian. 2015 will feature 4 home games and 6 road trips including trips to nearby Yerington Nevada and Mammoth. The 2015 schedule features a stretch of 4 consecutive road games beginning with a trip to Paraclete on October 2nd and finishes with back to back home games vs. Frazier Mt and rival Kern Valley closing out the regular season. The challenging schedule also again includes non-league games with private schools Arrowhead Christian (Redlands, CA) and Sierra Canyon (Chatsworth, CA). All Bishop Union High School varsity football games will be broadcast live on AM 1230 KBOV and streamed live at kibskbov.com. Yerington, 7-2, Nevada State Champions. Arrowhead Christian, 12-2, CIF finalist. Sierra Canyon, 11-2, CIF Semifinalist. California City, 5-7, CIF Semifinalist. Kern Valley, 10-1, High Desert League champions, CIF 1st round. A player and parent meeting for all interested in Bishop Union High School Football is set for Thursday, April 9th at 6pm. The meeting will be held in the room next to the Library at BUHS. The meeting will include information on spring football, summer activities and spirit packs. All Bronco Football players and their parents are encouraged to attend. Spring football for BUHS starts on Friday, May 8th.